So as you know, my adventures up North, where all the best beer is, have come to an end. Until I get up to Leeds and Bradford at the end of August, I’m stuck in the South so I figured I might as well make more of an effort with what we have down here. There must be some pubs and beers worth getting out for. Following on from my recent trip to Salisbury where I made the lovely discovery of The Village pub, I plan to actively seek out the best of what the South Coast has to offer. OK, I haven’t encountered a town quite like York, Sheffield, Leeds, Manchester or Newcastle yet in terms of the sheer concentration of pubs serving good quality, varied beer but there must be some good stuff? This week we have had the in-laws to entertain so we took a little trip with them to the beautiful Dorset village of Corfe, home to the famous Corfe Castle. Although the pubs seemed to have a rather uninspiring selection on the pumps, we settled on a rather delicious lunch at the Greyhound which boasts the honor of the ‘most photographed pub in Britain’ with good reason. It’s situated slap bang in front of the castle itself. The food was served in generous portions and cooked to perfection; I went for a fresh, locally caught mackerel with perfectly cooked garlic potatoes, but the ale was a choice between Doombar, some other dullness (can’t quite remember!) and Mallard IPA (4%ABV) from Cottage Brewing (Somerset) One poor chap at the bar was so confused he ended up with a half of Guinness and a half of Doombar. In the same glass. I was later advised by Twitter that this is an actual ‘done’ thing known as ‘Black & Tan.’ I am now intrigued. However, since I had never tried the Mallard before and have a soft-spot for train geekery, I ended up with a pint of that. Although it was a lot more mellow than the IPAs I’ve been enjoying recently, it made for a decent lunch time pint with very played-down, mellowed out fruity floral hops. No pretty little English village is complete without a lovely little village shop and luckily this little shop was well-stocked with Dorset Ales. Surprising that none of these local breweries seem to have made it into the local pubs I saw in Corfe. At least I can get bottles to try at home! 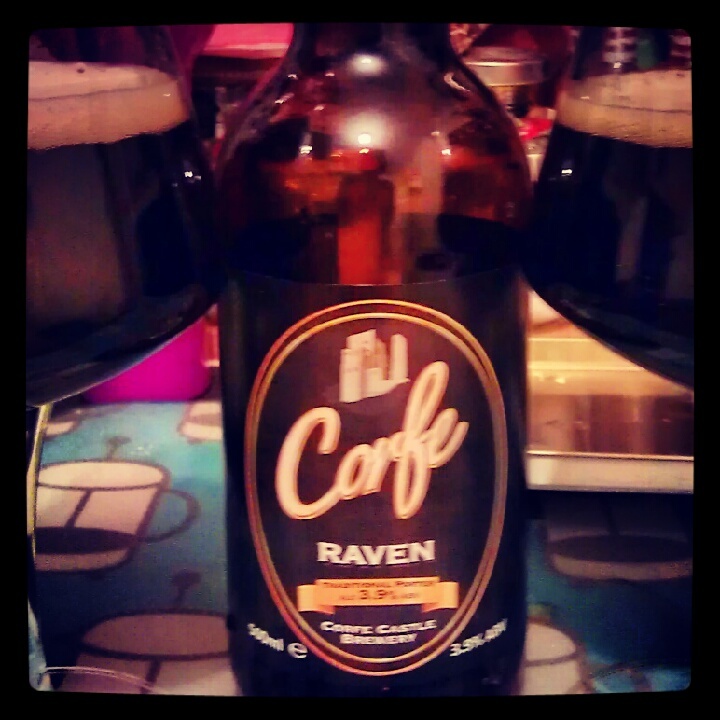 First was Corfe Raven (3.9% ABV), a traditional English Porter named for the ravens who have always been resident at the castle. The word ‘Corfe’ is actually derived from the ancient French for raven and it has been said that their presence at the ruins is a good omen. After a little drama with some liveliness opening the bottle, the porter poured out as black as a raven with a light and frothy head, oozing with aromas of chocolate, hazelnut and liquorice. Despite its relatively low ABV, it’s packed with delicious flavours of milk chocolate with some of the creamy characteristics of a milk stout. There’s a little bitter coffee at the back balanced by a touch of sharp raspberries. Pretty impressive! 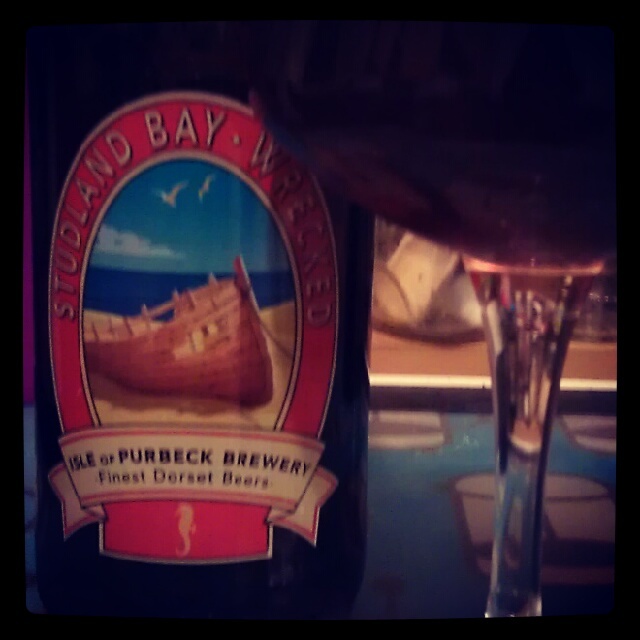 Next up was the Ise of Purbeck amber ale, Studland Bay Wrecked (4.5% ABV) which actually comes from a micro-brewery at the Bankes Arms Inn, Studland Bay. First impressions were good – the colour was a lovely cloudy burnt amber with autumn aromas of burnt toffee and spices. However, I found the flavour a little thin on the ground and somewhat hollow. Flavours of apples, toffee and spices were finished with a small zing and a touch of bitterness, but it was all too short-lived and straight-forward. The Dorset week finished with a pair from Piddle, a relatively new but well-loved brewery with a rather childish sense of humour. 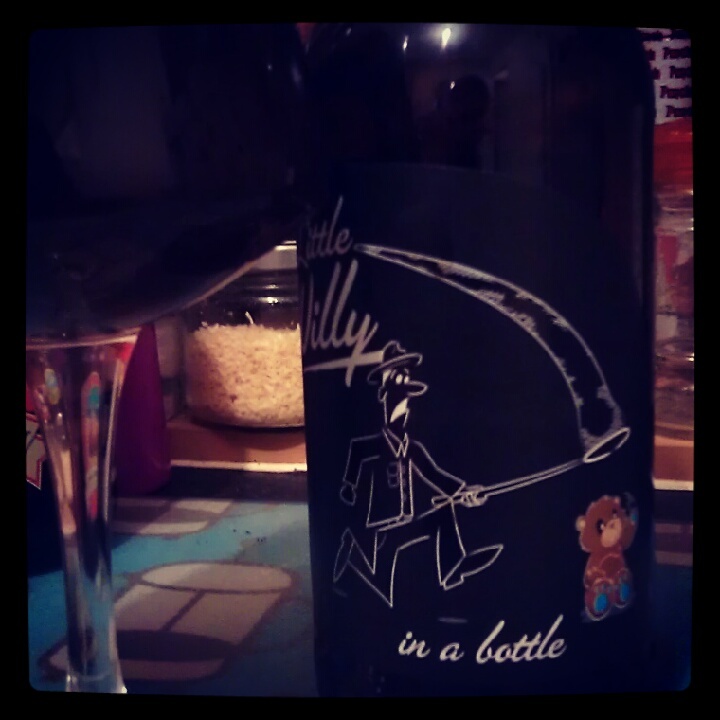 The first bottle we cracked open was Little Willie, named in honor of the world’s first tank which now resides at top Dorset attraction, the Tank Museum. As we have come to expect from bottle-conditioned beers, this one was just bursting to escape and had an impressively huge, thick head when poured out, although my pouring skills could have also played a part. The deep ruby-hued ale was bursting with bready, fruity aromas with black and red currants. The sweet and sour taste of raspberries and blackberries had the softening touch of toffee and vanilla rounding all the flavours off in a soft little fruity bunde. I found it slightly gasssy but this didn’t spoil it. This was a good example of how I want an English ruby ale to be. The final drop from Dorset was Piddle’s take on ginger beer. Since the fabulous Grandma’s Weapons Grade Ginger Beer seems to have disappeared, I am again on the search for a new favorite ginger beer. 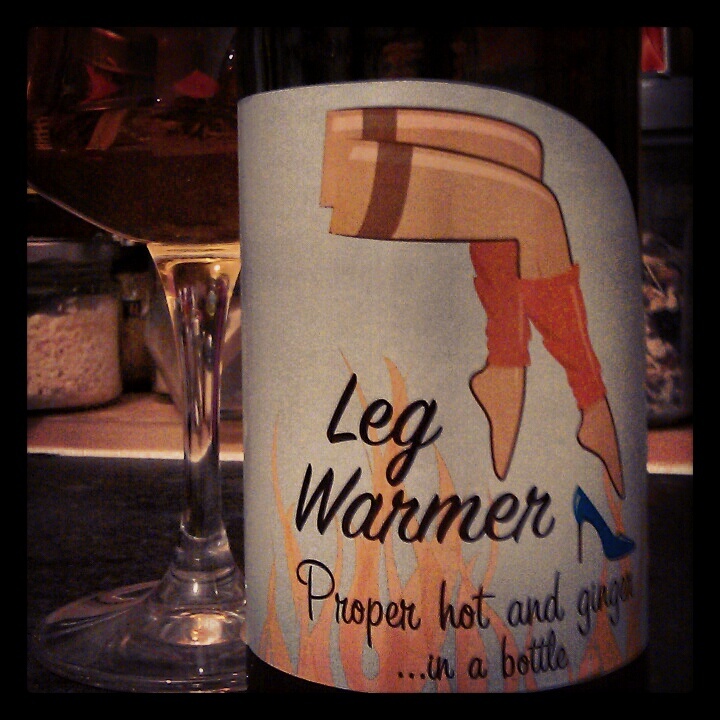 Sadly, Piddle Leg Warmer (4.3%ABV) doesn’t quite live up to the tag line of ‘Proper hot and ginger,’ but it’s still fairly pleasant none the less. It was a very pleasant clear golden colour with no bubbles and it felt quite thin which gave it a summery beer-garden-guzzler feel. The aroma was full of pure delightful candied ginger which carried into the flavour. It was a very sweet interpretation of ginger with a slight bitterness lurking in the background. The slight bitter dryness left in the mouth reminded me of the feeling after eating under-ripe bananas. Despite the sweetness, there was a little belly-warmth at the end. So the search for Grandma’s special sauce will continue, but if I’m hankering for ginger this one fills the gap nicely. my family go on holiday to Swanage every year (since 1988 i think) and i always end up drinking gallons of the various Piddle beers when i’m there and Leg Warmer is my favourite beach beer. the Greyhound actually put on a great beer festival in their garden every August bank holiday weekend, which is well worth checking out.